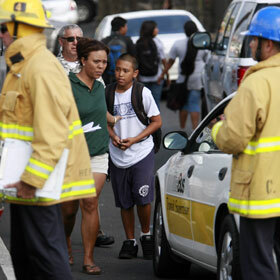 Students from St. Joseph School in Waipahu exited the campus yesterday afternoon following a report of a sickening odor that afflicted students and teachers. Hawaii's voters, typically an afterthought during presidential primary season, are the center of attention this weekend. With squatters gone, the Maili spot is cleaned up and accessible again. The city backtracks after temporarily discouraging access to Koko Crater Trail. A panel of experts must review data on different technologies without discussing it. A boy on the N. Shore invents a carrier that makes it easier to tote bulky body boards. Hawaii needs 11 innings to knock off Hawaii-Hilo. Residents moved out yesterday after the state Supreme Court refused to intervene. The carrier has lost $26 million for parent Mesa since starting here in June 2006. Democratic legislators are resurrecting a constitutional amendment to increase state judges' mandatory retirement age to 80.